The past few weeks have been difficult for former churches in Pittsburgh and the rapidly evolving situation surrounding the former Holy Family Church has been particularly concerning. A demolition permit filed without consultation with the neighbors raised concern from the community, preservation organizations, and the administration alike. Fortunately, the developer recently withdrew the demolition application for the former sanctuary. Before that occurred, however, a City of Pittsburgh Historic Nomination Form was submitted by representatives from several Lawrenceville community groups. For years, the groups have attempted to guide sensible development that integrates the former church into new residential development. We agree with this approach, which is why we assisted by writing the nomination for the building. It's clear there is future redevelopment in store for this Lawrenceville block and an historic designation for the sanctuary will help ensure it weathers the transition well and remains an integral part of the fabric of the neighborhood. With the availability of historic tax credits made possible by the impending National Historic District, it's not only possible, it's the soundest way forward. The former church is significant for several reasons. Its execution in Ecclecticism is particularly unique as it blends elements of Romanesque Revival, traditional Polish architectural design elements, and modernism. The church, the largest in Lawrenceville, is an established feature of the neighborhood that defines the street on which it sits as well as the entire neighborhood. 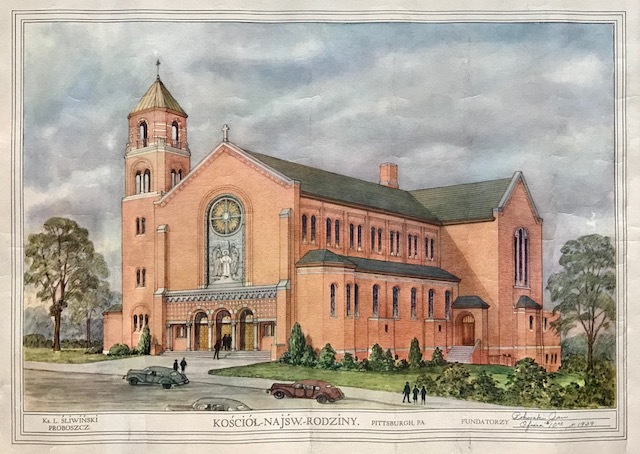 And the church's association with Anthony (Antoni) Prydrowski, architect, engineer, and builder, is of particular interest because of his accomplishments in the face of the tremendous amount of adversity he faced in his career. You can read more about the building and its history here. You can support the nomination by emailing your Councilperson (below) & the City's Historic Preservation Planner, Sarah Quinn: sarah.quinn@pittsburghpa.gov.